My dear friend Mary who just visited is quite the trip when it comes to food. Some of my favorite college memories of bumming around our apartment include efforts of trying to get her to try anything green. The two new foods she boasts about liking include sushi and edamame. But on Saturday night when the waiter took Mary’s dinner order, she quickly offered up her side salad to one of us. “Even Caesar! ?” I asked. Silly question, I guess. Mr. Prevention and I enjoyed our salads while Mary enjoyed her merlot 🙂 It’s still fun to give her a hard time about her culinary closed mindedness. She’s a good sport about it, too. Seeing as the Illini played this weekend, I had planned to make another chili recipe but all of the recipes contained an ingredient or vegetable that I thought better than to serve my Mary. Though, she does excel at picking around the good stuff! She questioned what “those things” were on my kitchen island and when I told her they were tomatillos she gave me a confused look and confessed that she had no idea what they are. I explained that tomatillos are what salsa verde is made from. While this meal wouldn’t likely cross Mary’s lips, Mr. Prevention and I enjoyed this as our non-traditional (but grilled!) Labor Day meal. I love the use of the grill and as far as enchiladas are concerned, this recipe was very simple. 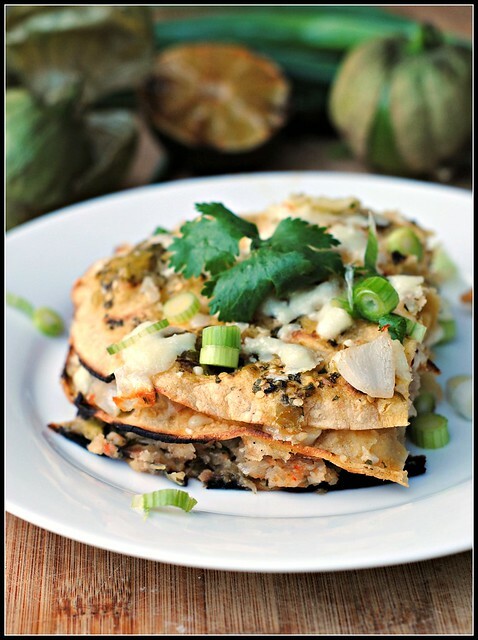 The layering of corn tortillas is brilliant and saves some time from the traditional rolled enchilada. I also appreciate that this is an all-in-one meal. 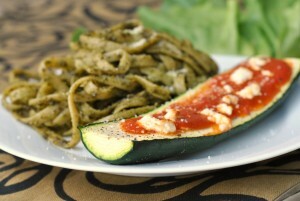 You’ve got your protein, carbohydrate, and veggies all in one. This also reheated much butter than expected. It’s even better with a dollop of Greek yogurt or sour cream! Mmm! Heat the oven to 350 F. Spray a 9-by-13-inch pan with nonstick spray. Preheat a grill (indoor or outdoor) over medium-high heat. In a large bowl, combine the cumin, chile powder, and olive oil. Add the shrimp; toss to coat. Thread the shrimp onto skewers. Thread the cubed onions onto skewers. Spray or lightly brush the onions and the tortillas with the oil. Grill the onions and tomatillos about 5 minutes before rotating. After 5 minutes, add the jalapeno, garlic, and lime and grill for 2-3 minutes before adding the shrimp; grill 1-2 minutes per side (do not overcook!). Remove everything from the grill and over high heat, char the tortillas slightly by grilling 20-45 seconds per side, flipping using tongs. Remove the onions from the skewers and transfer to the bowl of a food processor; process until coarsely chopped. Add shrimp to the onion and pulse to roughly chop the shrimp; remove to a bowl. Add the tomatillos, jalapeno, garlic, scallions, juice from the lime, and cilantro to the food processor bowl; process until smooth. Spread a thin layer of the tomatillo sauce over the bottom of the prepared pan. Distribute 6 tortillas evenly over the sauce. Top with one-third of the remaining sauce, then half of the shrimp mixture and one-third of the cheese. Repeat the layering of tortillas, sauce, shrimp, and cheese. Distribute the remaining tortillas over the cheese, then the remaining sauce and remaining cheese. 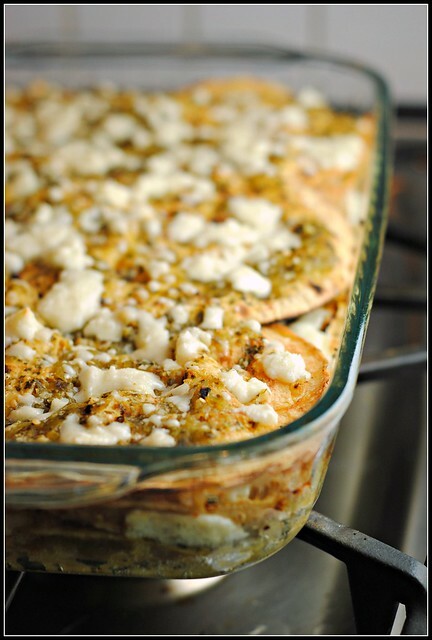 Bake, uncovered, until the cheese is browned and the edges are bubbling, 30-40 minutes. Let rest 5 minutes before serving. Result: This was phenomenal. I appreciated the ease of throwing everything on the grill and only “dirtying” the food processor bowl and blade. 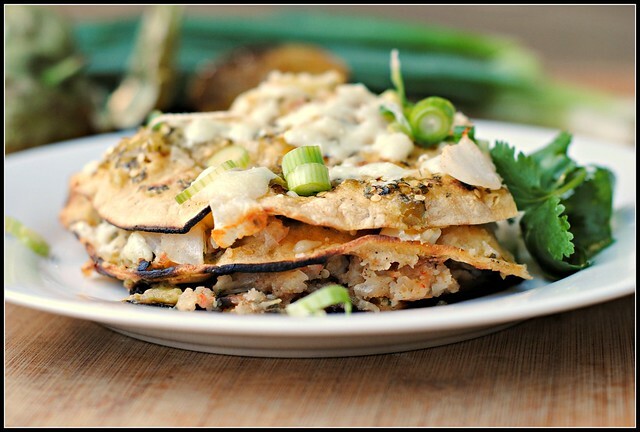 Very little clean-up involved for homemade enchiladas…plus, the grill adds tons of flavor. I adapted the directions to leave the shrimp more coarsely chopped versus a near puree, but you can certainly adapt the texture to your preference. Enjoy! Hoping this week continues to go by fast…Monday was a blur! When my friend Mary got married last year, the wait staff was instructed to not even serve her husband the salad. They accidentally did, and he refused to take it and said “um… no thanks, I don’t do green”. I laughed. I don’t know that I’ve ever had a tomatillo or if I have, I wasn’t aware of it. I must change that. Umm wow. I want to eat this immediately! Your friend Mary sounds like an absolute trip! I love that description of you and Mr. P eating salads and Mary licking back with a glass of Merlot, lol. This looks amazeballs! I just wrote this in my book for my lunch menu next week – the hubs wouldn’t touch this with a 10 foot pole! Genius Recipe . I’m running to make this sauce now!! 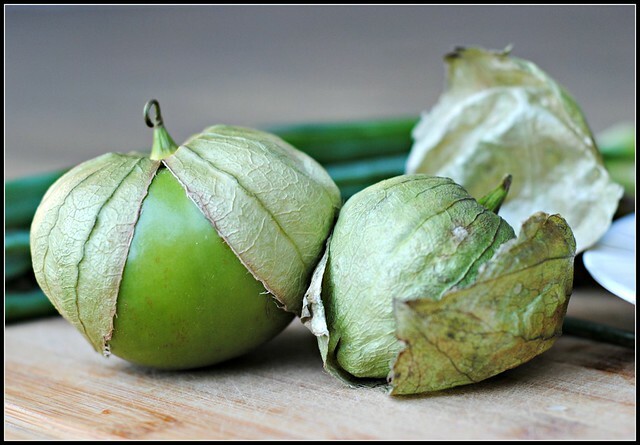 I’ve never tried tomatillo, but it looks amazing! I agree that I loved the idea of it being layered. Your friend is too funny! I have a cousin like that. She is also a pro and picking out certain things in her food. You’re such a good sport, Mar 🙂 Your picky eating makes for great writing material 😉 Thanks again for visiting…lovies! I had a lawschool friend that never ate veggies growing up, and so even salad upset her stomach! Well, I know what is at the VERY top of my list of foods to make when I get back to San Diego! 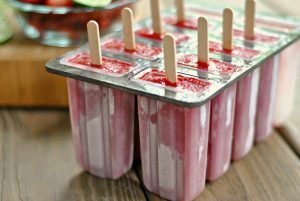 This looks sooooo freaking delicious!